Now you see back in the day when shareholders were NOT the only reason railroads existed and when railroads still had a modicum of “class’ efforts were made to offer both a high level of service AND project a modern progressive image – at some cost. In what became the final days of trans-Canada passenger service on CN the company shed the dull, smoking lounge look. The heavy, prewar greens and blacks were gone. It was a major departure from what was the norm and the world took notice giving CN high praise for their unique design concepts. No road 19th century style road name now. Just a clean, black and white arrow, tipped with red, slicing across the landscape and into the mountains. My very young family took that Super Continental from New Brunswick to Kelowna and all the way back. It was our own Centennial project. You remember those? It was our holiday of a lifetime. 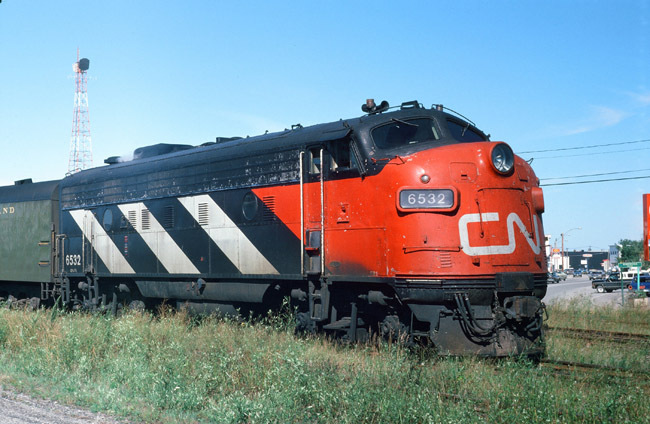 Those days are gone but the paint scheme lived on through the 70’s only dumbing down as access to foreign markets expanded into territory unfamiliar with the history of Canadian railways and CN in particular. It’s 1978 though so I could still spend ‘shopping afternoons’ in the Kap just to be standing next to the streamliner of my life and listen to her burble away in the sun and the tall grass. Check the details. Check the spartan 4036 and then look at 6532.